(Entry was posted by Jim Munro on this post in the Dumb SEO Questions community on Facebook, Thursday, August 24, 2017). 2-day conference. International Speakers. Actionable digital marketing knowledge. 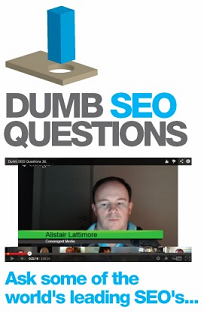 View original question in the Dumb SEO Questions community on G+, Thursday, August 24, 2017). Mobile responsive or a separate mobile site? Does Geotagging images help you rank better? Call Google and tell them people are searching for ME! What do you use to test a specific url? Does "Pingler.com" help in SEO results? What is long tail keywords? Is good or bad for SEO? Should I noindex the dozens of city specific pages a site has? Is "Content Length" a ranking factor? Private "Whois" is it good or bad for SEO? How do you know when you are receiving a demotion from a specific algorithm? Can 2 pages on the top 10 have the same title in the serps? Will translated content be penalized for being duplicate content? Any of you heard of TrustPilot? What`s your strategy for finding new clients? Do I need canonical url for unduplicated pages?